Joshua Winslow Groban (born February 27, 1981) is an American singer, known for his mature, and versatile baritone voice. His musical style ranges from classical to pop. Josh Groban was born in Los Angeles, California to a Jewish American father, of Russian/Polish descent, and a Norwegian American mother. His father converted to Christianity upon marriage and Groban was raised an Episcopalian. He has a younger brother Christopher who shares a birthday with him only 4 years later. Groban debuted as a singer in seventh grade, but soon after put singing on hold for a few years. "I enjoyed the arts aspects, but my grades were slipping. I didn’t feel that I was getting enough creative input. So I went to Bridges Academy, to get my grades up to straight A's." While at Bridges Academy, Groban took normal classes from 9:00 AM until 1:00 PM, and then afterwards attended theatre classes. In 1997 and 1998, Groban attended the Interlochen Arts Camp, majoring in musical theater, which is also when he began taking voice lessons outside of school. "I started taking music lessons on the side. I was very much into musical theater. I had a pretty good baritone voice, so I began acting and singing in school productions". In late 1998, the 17-year-old Groban was introduced by his vocal coach to Grammy-winning producer/arranger David Foster. Groban worked for Foster as a rehearsal singer on a series of high-profile events, including the 1999 Grammy Awards -- where, as a stand-in for Andrea Bocelli, he rehearsed Foster's "The Prayer" with Céline Dion -- and the January 1999 inauguration of Gray Davis as governor of California. Josh auditioned with "All I Ask Of You" from Phantom of the Opera for the latter, which occurred only one month previous to the Grammy Awards. Josh attended the Los Angeles County High School for the Arts as a theater major and graduated in 1999. After graduation he expected to attend Carnegie Mellon University in Pittsburgh, PA.
After only one year in the theater department at Carnegie Mellon University, his choice school, Groban left when he was offered a recording contract at Warner Bros. Records through Foster's own 143 Records imprint. With regard to signing Groban, Foster said: "I love his natural ability in the pop and rock arena, but I love his sense of classics even more. He's a true musical force to be reckoned with.” Therefore, under Foster's influence, Groban's first album focused more on the classics with songs such as "Gira Con Me" and "Alle Luce Del Sole," the first ones decided on by Foster and Groban. Soon after being picked up by Foster, Groban went on to perform "There For Me" with Sarah Brightman on her 2000-2001 La Luna Tour, featured on her "La Luna" Concert DVD, and made his recording debut by singing "For Always" with Lara Fabian on the movie soundtrack to A.I. : Artificial Intelligence (2001). He also became involved in many benefit shows, including the following: "The Andre Agassi Grand Slam Event For Children", singing alongside Elton John, Stevie Wonder, Don Henley and Robin Williams; "Muhammad Ali's Fight Night Foundation" which honored Michael J. Fox and others; "The Family Celebration" (2001) which was co-hostd by President Clinton and his wife, David Kelley and wife, and Michelle Pfeiffer; and Michael Milken's CapCure event, which raises funds for cancer research. In May 2001, Groban played the role of Malcolm Wyatt in the season finale of the television series Ally McBeal, performing "You're Still You." The series creator David E. Kelley was impressed at Groban's performance at The Family Celebration event, and, based on the audience reaction to Groban's singing, Kelley created a character for Josh in this finale. The character of Malcolm Wyatt was so popular, with 8,000 emails from fans, that Groban was asked to come back the next season to reprise his role and perform "To Where You Are." On November 20, 2001, Groban's self-titled debut album Josh Groban was released and, over the next year, it went from gold to double-platinum. 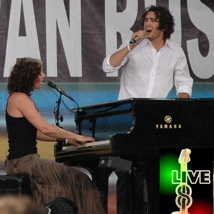 On February 24, 2002, Groban performed "The Prayer" with Charlotte Church at the closing ceremonies of the Winter Olympics, and by November, he had his own PBS special Josh Groban In Concert (2002). The following month, he performed "To Where You Are" and "The Prayer" at the Nobel Peace Prize Concert in Oslo, Norway, and joined The Corrs, Ronan Keating, Sting, Lionel Richie and others for a holiday performance at the Vatican in Rome, Italy. Two months after Closer was released, it rose on the Billboard charts from number 11 to number one. Both of Groban's albums were produced by David Foster, released under Foster's 143 Records and distributed by Warner Music. His cover of Secret Garden's "You Raise Me Up" became very popular on the adult contemporary charts. Josh also performed in the soundtrack to Troy (film), composed by James Horner, featured in the song "Remember" with Tanja Tzarovska. He also performed in the soundtrack to Robert Zemeckis's 2004 animated film The Polar Express (film), featured in the song "Believe." The song is composed by Alan Silvestri and Glen Ballard. During the summer of 2004, Josh once again returned to the birthplace of his artistic growth, Interlochen, where he gave a legendary performance to local residents of Michigan and the many, many campers, ranging from elementary school to high school age. He additionally signed many autographs, and spoke about his experiences as a young performer. On November 30, 2004, his second live DVD, Live At The Greek, was released. It also ran as a Great Performances special on PBS. Also in 2004, Josh performed "Remember When It Rained," backed by a full orchestra, at the American Music Awards where he was up for Favorite Male Artist in the pop category. Josh and/or his recordings were nominated for more than a dozen awards in 2004, including the American Music Award, World Music Award, Academy Award, and a Grammy. Other appearances include The Oprah Winfrey Show, Jay Leno, Larry King Live, The Rosie O'Donnell Show, 20/20, The Today Show, Macy's Thanksgiving Day Parade, and the Rockefeller Tree Lighting.